With the upcoming Lionfish Hunt is taking place on Friday November the 17th I thought I’d do a blog entry about the invasive & pesky but beautiful lionfish! There is a lionfish invasion in Roatan, and you can help take part in this battle. 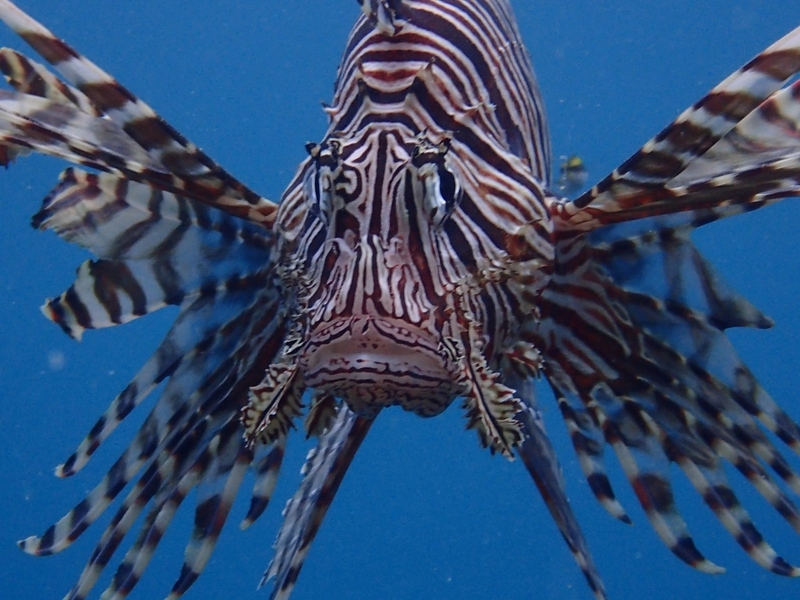 Lionfish are an invasive species that have become common in some parts of the Caribbean. 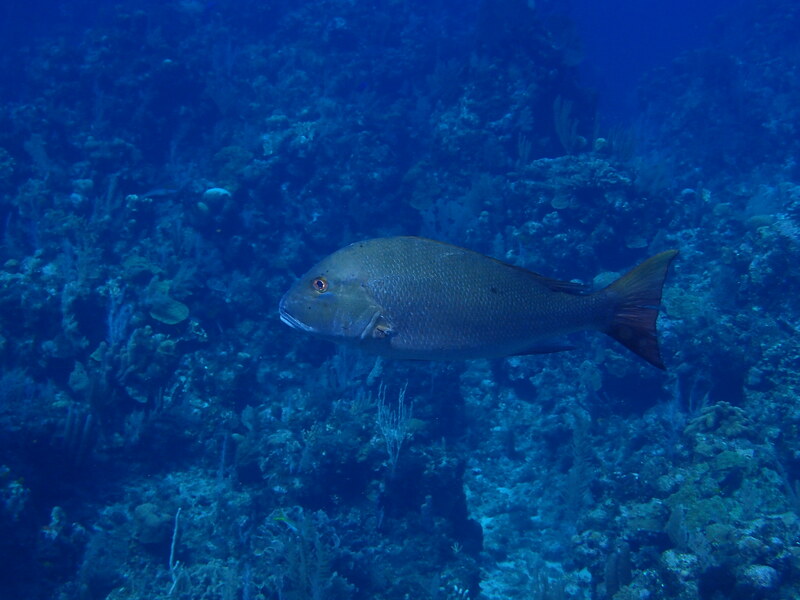 As predators, these fish compete with or consume many other species of fish in the Caribbean, and have no natural enemies to control their numbers. Lionfish are native to the Indian and Pacific Oceans. The fish have made their way into familiar waters in the Caribbean, the Gulf of Mexico, and other parts of the Atlantic Ocean as far north as North Carolina by hitching rides on freighters, or being released by aquarium owners. 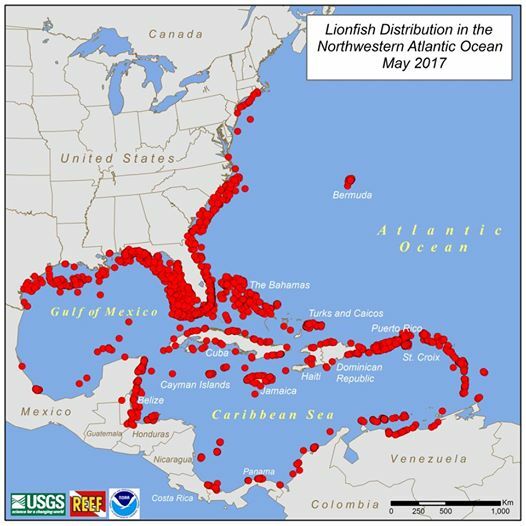 Most recent update of the lionfish invasion map from Pam Schofield PhD and Amy Benson MS of USGS as of April 24, 2017. 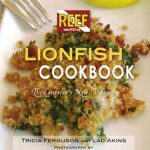 In the Caribbean, lionfish threaten the native fish and the natural environment as they compete with local organisms for a limited number of resources in an already biologically depleted coastal zone. The lionfish, a highly venomous and spiny ocean-dweller, lives up to its name as a hunter and devourer, chowing down on all types of small fish and organisms across the Caribbean. Lionfish eat almost every kind of fish that can be found in the Caribbean. 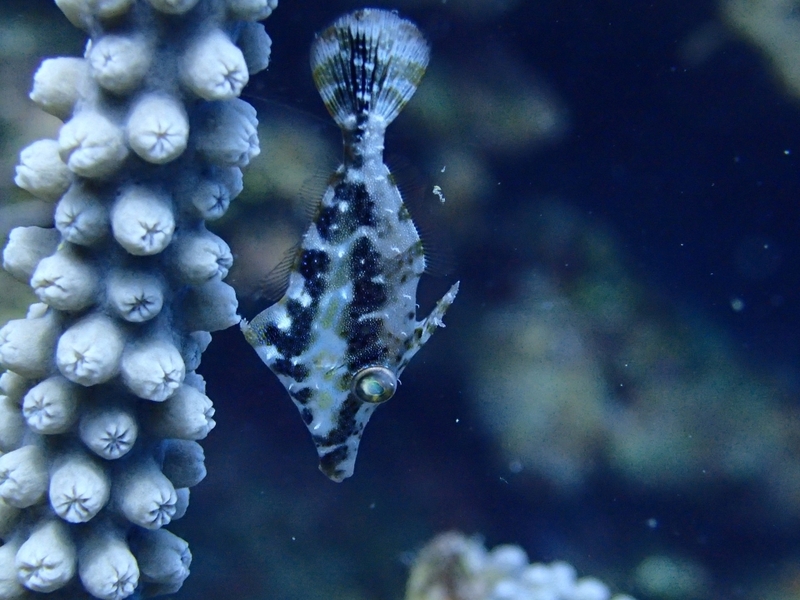 This means that as the lionfish population increases, the population of native fish will continue to decline. Lionfish have no known natural predators in the Caribbean, leaving the job of limiting their growth solely to human interference. 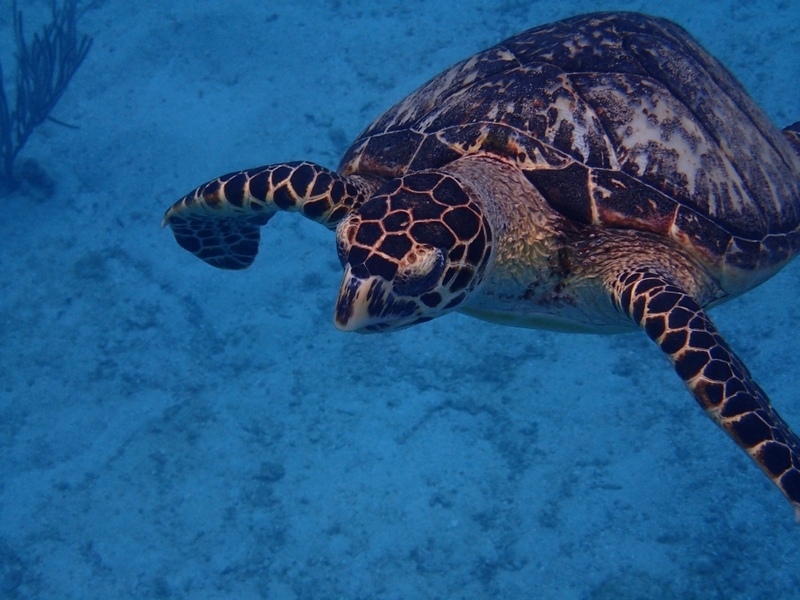 So what can you, as a Caribbean traveler, do to help defeat this ravenous, reef-destroying menace? It’s simple: you can hunt them, and you can eat them. For starters, lionfish are highly venomous. The fish are not poisonous (it’s safe to eat them), but, you run the risk of being injected with toxins if you are pricked by one of their spikes. 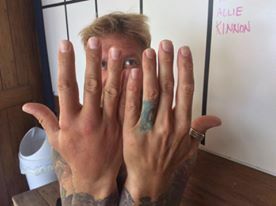 Be sure to stay away from lionfish spines. If you don’t know how to handle lionfish safely, then don’t hunt them. 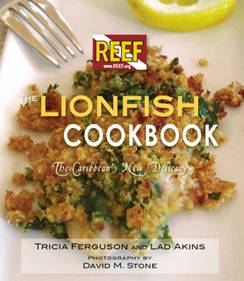 Second, the lionfish cannot be reeled in like a typical gamefish–they simply won’t take the bait. Instead, the best way to hunt a lionfish is by diving down and spearing them. With spearfishing, lionfish are very easy to stalk and capture, especially when they are swimming in shallow waters. However, be warned: allot of locales in the Caribbean ban spearfishing. 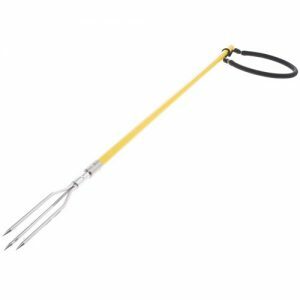 If you do go this route, be absolutely sure spearfishing is allowed. 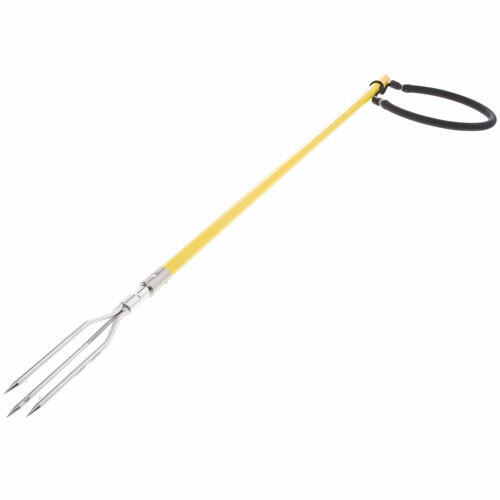 If you’re going to spear thing about using a Zookeeper as well! 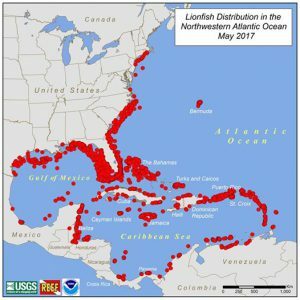 Please report all sightings of the invasive lionfish directly to the following link provided by the United States Geological Survey (USGS), which is helping coordinate efforts to eradicate the lionfish and other invasive species in the Caribbean: This is the easiest way these “red dots” can be placed on the map of the Caribbean, and a stronger strategy for reducing lionfish numbers can be created. So if you’re here and want to help clean up the reef come find us at Ocean Connections. We do bi-monthly trips to the south side in search of these critters but we also do daily trips all over the north side. 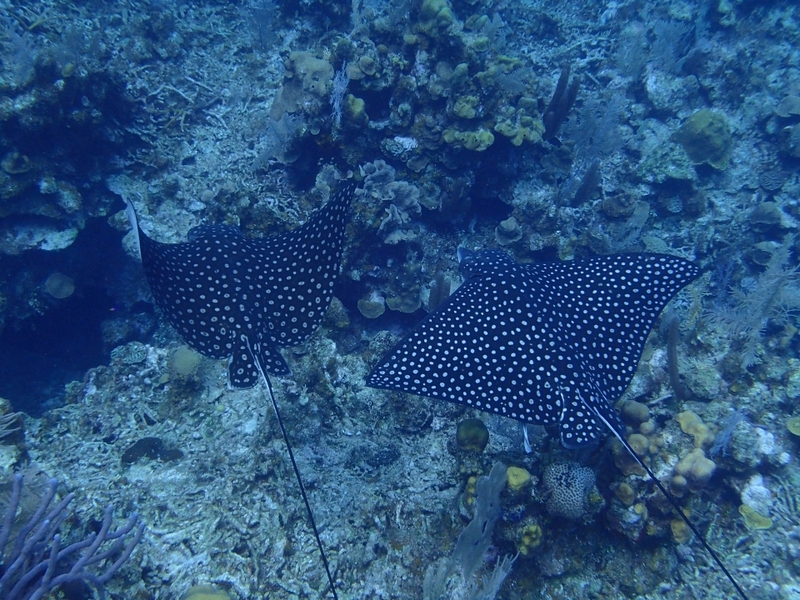 Here’s a neat video a friend of mine shot while here in Roatan. Enjoy! Let us know if you tried them and what you think. ← Who’s who in the zoo…Choosing the right dive op for you.